North of Fairbanks, Alaska, in the summer of 1997, a mechanical problem caused my BMW R65 to go into a tank-slapper at 50 miles per hour. I ended up face down on the Haul Road with a compound fracture of my left wrist. “Cookie crumbs,” was how the emergency room surgeon described my forearm bones. In the months that followed, I was asked many times about the casts and scars on my arm. Naively, I wanted to talk about my crash with the idea that I could help others avoid a similar accident. In telling the story, however, I noticed an odd quirk of human behavior: most people don’t ask a question in order to listen for your answer. They hear what they want to hear and walk away with fears and preconceived notions securely intact. Here are some of the most common ways people reacted to my story. But her eyes had already glazed over. “No way,” she muttered. How surprised she will be, I thought, when she finds out that her son has been riding the neighbor’s dirt bike on the sly. Forbidding it because it is dangerous is the surest way to guarantee that the kid will try it. 2. It was someone else’s fault. The “other driver” theory survived my numerous denials of plausibility. Some people turned into ranting maniacs at the sight of my broken arm, going on and on about irresponsible, inattentive, stupid motorists. When I could shush them long enough to say that no other vehicle was anywhere near me when the accident happened, these blamers inevitably started in about inadequately graded roads or the oppressive weather (rain, cold, sun in your eyes, whatever) in Alaska. 3. It was your own fault. The most blatant proponent of this theory was the owner of a certain motorcycle shop whose term, “rider effect,” translated to mean that I didn’t know how to handle a motorcycle. Insulting? Yes. True? With all humility, I don’t think so. 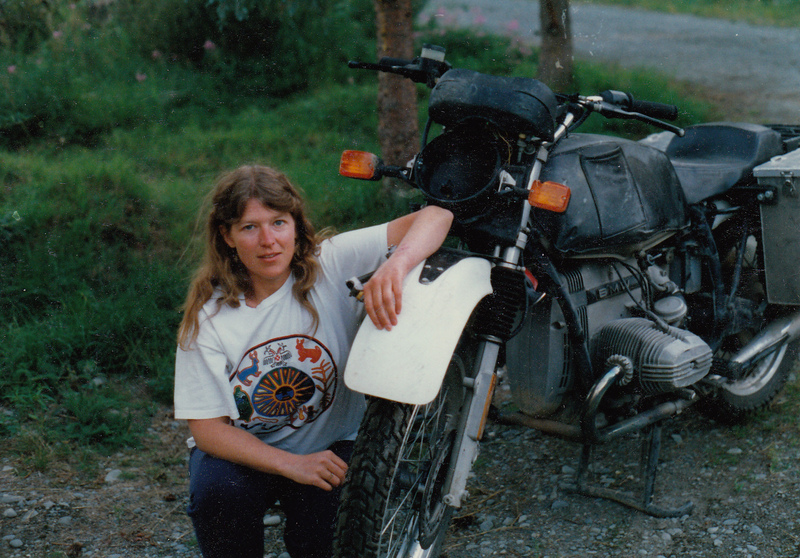 While riding street and dirt bikes for the previous five years, including a tour of the back roads of Costa Rica on a Honda XR200, I had become a very proficient rider. I tried to take these accusations with a grain of salt. Apparently a “blame the victim” attitude is so commonplace that Ph.D. candidates in Psychology have written theses about this mindset. I knew in my heart that I was not drunk when the accident happened. I was not incompetent. I was not wearing a halter top. I knew even if they didn’t, that I was doing everything right. If there was any blame to put on myself, it would have been for unwillingness to give up on a ride that had been planned for months. I should have refused to go any farther until my bike was repaired properly. But my pride didn’t allow me to be the girl rider who couldn’t keep up with the guys. So instead, I gritted my teeth and continued on with a high speed front wheel wobble. Seven hundred miles later, the result was disaster. Yes, and then I could have spent the rest of my life cursing him for mangling my arm. (See “It was someone else’s fault, above.) I’m not against riding double. In fact, for three years after the accident, until my arm was completely healed, all of my riding was as a passenger behind my husband. There is nothing wrong with riding pillion. But a lot of effort and practice went into the acquisition of the motorcycle endorsement on my license. Berating me for the achievement of learning how to ride felt like a step back into the 1950s for woman riders everywhere. Well, I understood that people held differing views on God. But I had to go with my own spiritual beliefs, which did not include a God who caused wrecks or broken arms. The way I saw it, the crash had nothing to do with God and everything to do with a mechanical malfunction of my motorcycle. Of all the people who asked about the crash, there was only one who actually heard the moral of the story. After listening to my tale, the guy went home and inspected his own bike. He discovered that his tires were weather-checked and the rear brake needed replacement. So I didn’t despair. Once in a while, someone did listen without prejudice or fear. Sharing my story with that guy might have truly done some good. As for everyone else? I tried not to think about them too much as I sat on my motorcycle (which was parked in the living room), making mouth noises and practicing to work the clutch with my mangled left hand. It took three years, four surgeries, two bone grafts, and many months of physical therapy to repair the damage to my arm. Once all that was finally past me, I quit talking to anyone about the crash. Leaving the opinions where they fell, I climbed onto my motorcycle and rode away.